The Akona Quantum Glove is the first diving glove created with an all new, exclusive neoprene. The unique combination of neoprene and nylon materials gives you the most flexible neoprene glove ever. 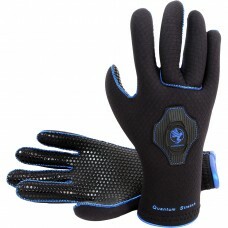 The Quantum glove is superior to all other neoprene when underwater dexterity is paramount. Akona Quantum Stretch (four-way stretch) 3.5 mm nylon II neoprene is glue and blind stitched for a durable water resistant finish. Ergonomic, pre-bent fingers offer comfort and allows for minimal water transfer. Akona grip polyurethane (PU) screened palm is designed to provide superior grip with outstanding flexibility and dexterity. The Quantum Stretch Gloves have a Skin-In Cuff that minimizes water transfer at glove/wetsuit seal.